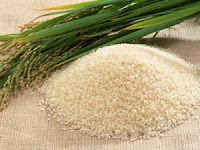 Is the type most widely consumed rice. 'White Rice Organic' compared with 'white rice Un-Organic' is very different, because it seems more fluffier and more fragrant. Does not contain chemical pesticides, so it is safe to eat. Still contain high nutrients and minerals needed by the body. Having the content of vitamin B1 and minerals are higher than in white rice. Contains more magnesium, which is very good for cardiovascular health (heart). Rich in fiber and fatty acid content of high fibernya to prevent constipation that facilitate pencernaan. While a high fiber content also makes you more full and not hungry so easy to fit to your diet. Rich in amino acids and GABA. One way to cook brown rice that is known is the technique of 'Gamma-aminobutyric acid' (GABA) or 'germinated brown rice' (GBR), which can increase growth hormone in humans.